After checking on the progress of Glamor for Intel chipsets, it is time to have a look and see what the state of play is for a Radeon HD5770. This card is now a few years old and is sitting in a Sandybridge i5-2500 desktop. The baseline I have chosen here is the performance of the Intel DDX using SNA but with acceleration disabled – that is it is completely rendering using the i5-2500 CPU. Or to put a positive spin on it, the new Glamor acceleration on this particular r600g device is about 50% faster than the existing EXA radeon driver. If you look closely there are just a couple of traces that EXA performs better than Glamor, with those regression fixed Glamor would be a clear improvement for radeon. And almost as fast as not using Glamor at all! However, Glamor was not able to complete the benchmark run without crashing. For this particular set of benchmarks based on Cairo traces taken from real applications. 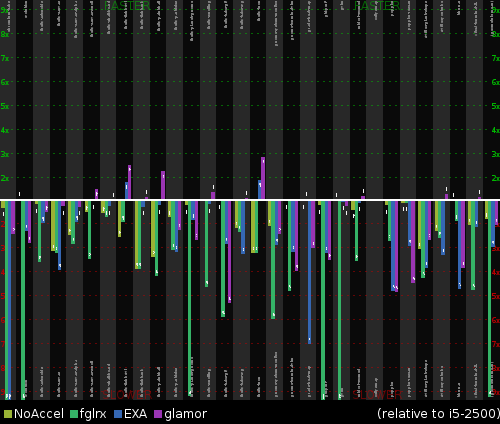 If we look at synthetic benchmarks, Glamor is significantly faster in several key metrics than EXA, and fglrx is much faster again. Always take benchmarks with a pinch of salt. 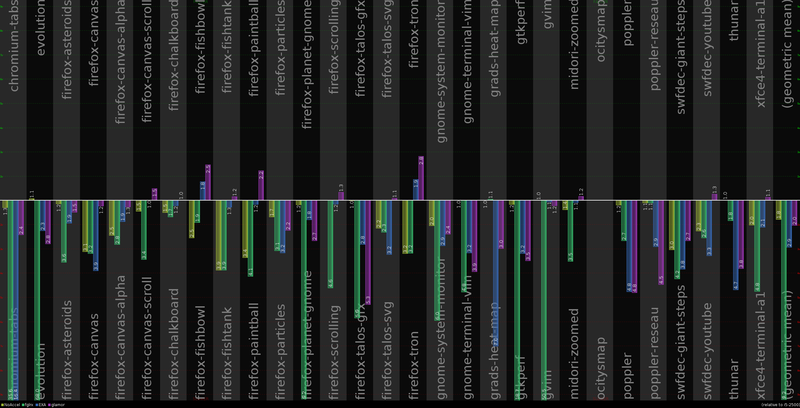 The biggest problem with glamor seems to be CPU overhead, really. (And terribly slow fallbacks.) On a system with fast CPU vs slow GPU, it can outperform EXA. On a system with slow CPU vs fast GPU, it can be much slower than EXA. Well, the EXA layer is not much better. It also has a terrible CPU overhead. To be more specific, on ARM hardware the EXA bookkeeping overhead (compared to having no EXA hooks installed by the DDX driver) costs roughly the same in terms of CPU usage as 1/3 of the whole work done by the cairo image backend. Which basically eliminates EXA as a viable option for even trying to implement any kind of 2D acceleration using it.